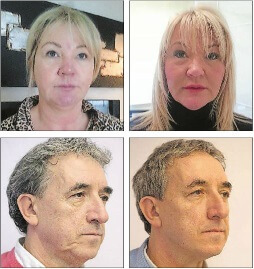 This week we featured in the Romford Recorder to advertise the Silhouette Soft Thread Lift – A new cosmetic treatment offered here at Aesthetics of Essex. When women are asked what they consider their two main signs of facial ageing, the answer is invariable loss of skin tone, causing sagging of facial contours and the appearance of wrinkles, fine lines and creases. This unfortunately worsens with the natural age process and the menopause due to the loss of collagen, the protein found in all structures of the body which ensures elasticity and regeneration of tissue. With age, collagen diminishes and the skin becomes less firm and become saggier. The face also loses fats (becoming more skeletal), becoming hollow on the sides, and heaviness accumulates under the chin and lower cheeks, which is what gives us a more ‘aged’ appearance. The Silhouette Soft Thread Lift is a treatment recommended to both men and women who are seeking a significant facial lift, without the need to go under the knife or invasive surgery. It works to restore plumpness to the skin and reduce visible wrinkles with a short 30-minute treatment. Based on six years experience and made in the United States, Silhouette Soft comes in the form of bidirectional absorbable thread cones which are used in reconstructive and cosmetic surgery. The unique treatment enables two combined actions. Firstly, a discreet and immediate lifting effect: as soon as the suture is applied, the treated area is reshaped by compressing and elevating tissue. Second, a gradual and natural regenerating effect: in being absorbed, the component of the suture, polylactic acid stimulates the natural production of collagen, restoring shape to the face. The procedure requires innovative threads being inserted through a micro incision in the hairline area. The sutures are then deployed in the soft tissue of the problem areas and pulled backwards until the cones engage the tissue of those facial areas. This engagement suspends and lifts them to a higher location to create a tension – which instantly lifts the sagging tissue. The results last up to 18 months, with no downtime, so you do not have to take time off work and can go back to your daily life with a newly redefined face. Prices are £350 per thread, with a full non-surgical face-lift requiring just two threads.